Review Summary: On the whole SHARAARAT is too ordinary a fare to leave any impact. On the whole SHARAARAT is too ordinary a fare to leave any impact. 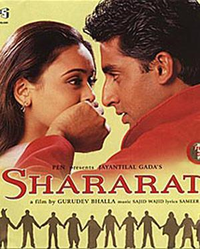 Shararat is the story of a young boy who becomes the life of abandoned old men. Yes, of course, in between you get many sidekicks, villains and vamps that test the young lovers and ultimately bite the dust. When a film takes too long to release, it gets outdatedand jaded.